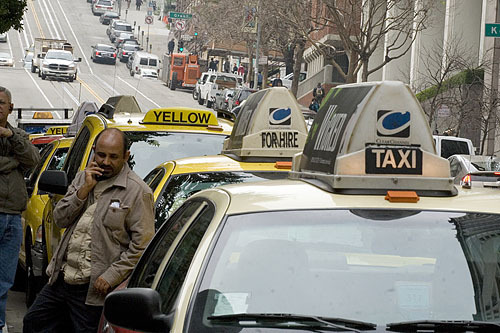 SF Taxi Media: Cabulous, Uber, and San Francisco's Poor Taxi Industry, by John Han. Cabulous, Uber, and San Francisco's Poor Taxi Industry, by John Han. SF taxi driver Erik Hatten sent in this link to an article published on TechCrunch entitled, "Uber, Not UberCab, Launches Android App." by Evelyn Rusli. Apparently Uber, formerly called UberCab, is ramping it up, cooperating with regulators, and doing fine. Well good for them. But if I may indulge in the opportunity, both Uber and Cabulous are indications to those of us in the cab business that San Francisco's taxi industry needs to start evolving. One of the ways it can do this is through the controversial 'centralized dispatching system'. It is a long held idea that passengers phoning in for service deserve the option of calling their favorite cab company, or, if not, may choose to call a central dispatch number that would dispatch the closest available cab, regardless of what company it is, since all meter rates are the same. Many drivers want this, local politicians have said they wanted it, policy studies have recommended it, and the public seems to want it enough that that some of the more entrepreneurial ones are trying to invent their own versions of one, i.e., Cabulous, Uber. The ones who seem most adamantly opposed to the idea are the also the ones who control almost all of the radio dispatch services in the City... the cab companies. As it would seem, the cab companies' clench to maintain control over the industry is what prevents the industry from becoming what it could and should be. If only the general public understood by and large how San Francisco's taxi industry works, maybe then they would conscientiously support centralized dispatching. They already do in a way, by supporting Cabulous and Uber, they just don't really realize it. They also generally don't know that when they get on the phone and order a taxi, though they may think they are calling a company that's in business to provide them with taxi service, they are actually calling a car rental company that handles their order as an informational referral service to taxi drivers. "either the design or trade dress of a vehicle used as a taxi or ramp taxi that is distinct to the fleet of a color scheme business that provides taxi service..." (underline mine). "businesses that provides taxi-related services to affiliated drivers and medallion holders..." (underline mine). It's almost official then. Taxicab companies are almost completely out of the business of providing taxicab services to the public and are very, very close to legitimately being only a "taxi related" service provider that caters to taxi drivers... not the public. For those of us in the industry, we know that this is strictly for tax purposes and cost cutting measures. If taxi companies could be construed as providing taxi services, that would mean that taxi drivers could be construed as performing services and work that is directly related to their businesses. In other words, taxi drivers could be considered employees of the taxi companies, and therefore could be entitled to the same kinds of employee benefits and protections normally and historically associated with working people in America, like company provided healthcare, pensions, and the like. And, cab companies would be obliged to deduct employee payroll taxes like any other legitimate company in America has to do. "any person, business, firm, partnership, association or corporation which holds itself out to the public as a service by or through which taxis may be summoned or dispatched by radio, telephone, or other means of communication..." (underline mine). So it's almost official again. Dispatch services are just moments and moments away from being legitimately out of the business of providing actual radio dispatch services to passengers so passengers can get cabs. Now, very soon, they will only manage the public passengers' information as a referral service, so that when passengers phone in for a taxi, it will be like posting it on an electronic message board and hoping that someone will pick up the order and respond. Passengers are going to have to use the 'throw it against a wall and see what sticks' approach when it comes to ordering a cab. It's nothing new. This is how it's been already for so long, only now San Francisco is going to make it legitimate. Except the people, for the most part, still believe that when they pick up a phone and try to order a cab, that they're calling a company that's in business to provide them with taxi service. Because they are generally unaware that that is not true, that they are only calling a message service, they are being ripped off, and not only by San Francisco's taxi industry, (mainly cab companies), but also by the SFMTA. But what they do understand is that their radio service generally is bad, mediocre at best. And the SFMTA is making moves that will ensure that. That is why citizens are taking it upon themselves to explore alternatives such as Cabulous and Uber. They're looking for other ways to create better service. At the same time, cab companies can still hire and fire all the gate and gas drivers. Is this post about the failure to serve the public with transportation service? If so, you might read the comments on Uber's blog and Facebook page, as I have, to understand why that particular service has become so popular: the public perception of SF cab drivers is that they are rude, untrained in SF geography, the English language and how to operate their own payment processing equipment, that they refuse any fare that's not good enough for them or not paid in cash, perpetually talking on cell phones and unwilling to wash or change out of their PJs before going to work. Oh yeah, and as a broad generalization taxi drivers refuse to respond to radio calls because they are on their way to or from the airport or unwilling to leave downtown. If you want the public to want a SF taxi, you all need to look in the mirror for a part of the solution to that problem. Or perhaps the theme of this essay that the SFMTA is a slave to taxi companies, is deliberately ignoring the public's need for transportation service and happily screwing the drivers. The goal of the change in definition in dispatch service is to address changes in technology. The old definition does not take into account the modern uses of the telephone or the existence of the internet. The changed definition (the part you didn't quote) makes it possible for an application like Cabulous to provide direct access between drivers and customers, finally providing "centralized dispatch" capacity without triggering the objections to eliminating company branding in existing dispatch operations. This would allow SF taxi drivers to compete with a company like Uber. You say that "very soon [dispatch services will only be] a referral service, so that when passengers phone in for a taxi, it will be like posting it on an electronic message board and hoping that someone will pick up the order and respond." What do you mean "very soon"? That is exactly what is happening now. I agree with you that it is a broken system and needs improvement for both the passengers and the drivers' sakes. Acknowledging that phoning a taxi dispatch service is not a reliable way to get a taxi to appear at your door is the first step to fixing the problem. You make it sound as though it is the SFMTA's goal is to celebrate and perpetuate that disfunction. How is the SFMTA ripping anyone off? Our goal is for the public to be able to get a cab when they want it, for drivers to get more business and more paid miles and for companies to be profitable enough that they don't feel the need to steal and cheat. I don't know how you equate the steps we have taken in that direction with larceny against the public. The goal in changing the definition of color scheme is to conform the definition to reality: color schemes do not take any measures to ensure that a vehicle will arrive-that is within the function of a dispatch service. Changing the "color scheme" definition doesn't change anything about what happens every day in taxi companies. It is not as though if we left the definition of color scheme as it is today then companies would have to treat drivers as employees. Also, please do not believe Uber's press releases. For your information, the SFMTA and CPUC met with Uber last week. Both agencies are waiting for Uber to submit some written materials to further explain their business operations, and then both agencies will be considering what responsive action to take. It was acknowledged at that meeting that the company has intentionally disregarded the cease and desist order so as not to lose their business good will by a disruption in service, and that fact will be taken into consideration in determining a responsive action. Regardless of the ultimate agency actions on this matter it is likely that Uber will continue in business in SF once they have conformed their operations to the law. Refer to the paragraph above about how to more effectively compete with that service. And if you don't like how companies treat drivers you (drivers in general) need to communicate the problems to the SFMTA. We can't discipline a company if we don't know what they are doing. We are very careful to protect anyone who comes to us with enforcement information. Sometimes a 'tip' might not be enough for us to bring a complaint, but then at least we know what to be looking for. We can't control who a private company chooses to hire and fire, but we can start to shut down unscrupulous companies and communicate to those who stay in business that they will be held accountable for their conduct. But we need drivers to tell us what is happening in order to be able to do so. You need to accept that the current business model of the SF taxi industry is based on self-employed drivers. It was based on employee drivers about 30 years ago, but that model was deliberately changed because it didn't work. If you want to change it back, you have to change the entire business model of this industry. A few words in the definition of a color scheme will not achieve a fundamental shift in business models, no matter what they say. To have employee drivers would require splitting the meter with companies. I do not know if you have broad consensus among drivers that that is a model that you want to go toward. It didn't work before because the drivers left the meter off and underreported their income, dooming that system to failure. Given the circumstances in which we all find ourselves today, my goal has been to address the point that you have made to me before-if drivers are independent contractors then they want all the benefits of being independent, and not be treated like peons by company owners. They also require adequate income to be able to handle all of the expenses of a quality life. I think that is a more realistic goal than changing all economic assumptions of the industry as it currently operates--in short, you are just beating your head against a wall that is not going to give any time soon. If you really want to be an employee, then get on the list to be hired as a bus driver. Muni is hiring. You bring up some very good points. Drivers sometimes are as they are criticized to be - rude, lacking geographical knowledge, poor English, don't know how to use the equipment. There are many reasons why people will choose other forms of transportation services. No doubt, and no need to debate over words. We agree on some of the things more than you mentioned in your comments. But none of this changes the fact that many people have been wanting a centralized dispatching system for a long time, even some of the politicians and research experts, and that the only thing that's standing in its way is the cab companies, who control it yet do not even service the public. That's really the focus of the essay. As for changing definitions of color schemes, I mentioned that because it only further solidifies the FALSE independent contractor status of drivers. Changing definitions does not significantly change the relationship between companies and workers, but helps to protect companies from audits. In response to your last comment, I agree. I'm not, nor was I ever pushing for employee status, though I admit it may seem like it because of things I write about. If we are to compete with Uber for our business, I'm just wonder how the city can justify charging $250,000 for a medallion? How is this huge investment going to be protected if we have to compete with a basically unregulated industry which will continue to grow? Am I missing something here? You will never be able to "hail" a black car on the street, black cars will never be in the pit at the airport, there will always be taxi stands ect. . . and if the taxi industry will embrace the new technology and push their image in another direction the money is there. Of course there are alot of challenges as a system makes a major business model and technology change. Personally, I have and do use taxis in sf and as in any industry you have good and bad. The majority for me has been very good, but I pay cash it is easier, a couple times I had two taxis dispatched to the same location, but I only made one call. I am sure that I am missing the connection between the cost of acquiring a medallion and the competition between taxi drivers and limo drivers. The 'huge' investment is, in SF, subject to the most humane medallion purchase terms in the country: the FIXED price ensures that medallion income can completely cover the loan payments and the loan terms ensure that the loan can be completely paid within 15 years, the same time that people who are getting medallions now have been on the waiting list. So a SF driver in the process of acquiring a medallion is no different economic position than any other driver, and after the loans are paid that driver now has a 'huge' asset that few taxi drivers in the country can claim. In New York, by contrast, the medallion price is so high that balloon loan terms are the only way a driver can afford to pay the loan (and balloon loan terms are the only loans available). A NYC medallion is essentially never paid off, though the driver does build equity. No other jurisdiction in the country but SF fixes the price of a medallion in order to protect the driver's ability to pay the loan. Your industry is highly regulated, I don't know how you support the statement that it is not regulated. If you mean that there is not adequate enforcement against illegal operators in the street, I agree, and we are doing something concrete about it. Our team of taxi investigators is only waiting for the newly designed citation book stock to come back to the printer to get out on the street and start writing $5,000 citations to violators. Since I have been on board we have: (1) created a new class of "Taxi Investigator" with authority to issue citations and tow vehicles to work against illegal activity in the field so that you don't have to rely only on the police; (2) adopted the $5,000 administrative fine against illegal operators authorized by the state; (3) drafted criminal laws to increase the current misdemeanor penalty against illegal operators from less than $200 to $2,500; (4) created a new crime designed to be used against hotel door staff who sell referrals; (5) coordinated with the PUC to go after UberCab; and (6) set up the legal groundwork needed to (a) shut down the telephone service of anyone advertising taxi service without a permit and (b) tow and hold illegal vehicles for 30 days. So if you are saying that the activity of illegal operators will continue to grow, you are incorrect. I am confident that we have created enforcement capacity that will make the illegal operators know that if they come to SF they are taking a chance at suffering very serious consequences. The best news is that all those $5,000 fines are required by law to be used for illegal vehicle enforcement, guaranteeing a continuing source of funding for administrative and criminal enforcement. I am very proud of what we have accomplished, and I know that you will see the good results once we get our team on the streets over the next few months. Some years ago National Cab was sued because it did not carry worker's comp. It paid a lot, after losing. What is preventing the City from suing Uber and Cabulous? They should have been sued yesterday. You have most definitely done a great deal to combat the illegal limos and bandit cabs. That is obvious and we all owe you many thanks. You have fought hard for the taxi industry and drivers. It was your statement that Uber will most likely be able to operate legally in the future which scares the hell out of many. The new generation spends their whole life staring into their smart phone screens. If Uber succeeds, there will be an avalanche of others. Traditional taxis will become the niche players and eventually irrelevant. Please don't blame this on pajama wearing cab drivers. (Kind of like those welfare driving Cadillac owners) I've never seen a cab driver wearing dirty pajamas. There are many bad apples and you hear about them through 311. But who does the public complain to when they get gauged or intimidated by an illegal limo driver? Their is no 311 system set up for them. Hell, most of them don't even have license plates on their cars for a customer to take down. You don't hear that on twitter or Ryan Graves blog. The vast majority of those tweets you refer to are plants by Uber employees and friends. They don't allow negative comments about their service to be posted. Who wouldn't rather ride in an Escalade or Town Car rather than a Prius, other city mandated hybrid or old CNG Crown Vic. This is an unfair playing field we are being asked to compete on. Uber doesn't have to pay huge insurance premiums, workers comp or constantly rising permit fees. If 4 cab drivers took the 250k they are going to spend on medallions and pooled their money, they could start their own competing Uber. Let's just hope the SFMTA is clever enough to get this company run out of town, even if it means amending or changing the existing laws. The SF Federal Credit Union financing the pilot loan process has made it clear that illegal limos and companies like Uber are the thing they worry about most when assessing the future value of medallions. And that is the back bone of the pilot program. Thank you, Anonymous, for the legal advice. I would go into detail with you here over our legal strategy, but that is confidential information so you'll just have to wait and see. Any future Uber service, assuming it becomes legal, will be dispatching state-regulated limos. Whatever Uber did when it first started, they since wised up and begun screening their drivers for a valid TCP number. Therefore they would be dealing with legal vehicles and drivers and could not be regulated by the City. That is precisely why I say that our taxi industry is going to have to learn to effectively compete with that type of service. If it were up to me I'd throw Uber out of San Francisco entirely for their disregard of public safety and the rule of law, but that is beyond my power. I do, however, intend to make it part of this year's state legislative agenda to ask for local regulatory control over limos. In addition, the state needs to address the pre-arrangement requirement, which is rendered meaningless by smartphone technology, even though under the letter of the current state law Uber's technology complies (reservation by telephone). The situation is untenable, and only state legislation can fix it. That is of course a completely separate issue from the ILLEGAL vehicles out there. Each one of those vehicles represents $5,000 in potential revenue for my enforcement team, and I am motivated to find ALL of them. I know it has been a huge problem and we have not yet been able to deploy our enforcement resources in a manner to show you what we are capable of achieving. But please rest assured that we indeed have been working hard to build that legal and administrative framework to support a truly effective enforcement system in SF. Let's just say 2011 will be the year of illegal vehicle enforcement and you will finally see the results I have been promising. We are also committed to supporting the economic sustainability of our taxi industry, so that all of our permit holders can make a decent living and reasonable rate of return on their investments. This is where an outreach campaign to the public, improved driver training and re-training, enforcement of vehicle quality standards and 311 response come in. Like everything else we have been faced with over the past two years, these tasks have had to wait to rise to the top of many, many urgent priorities, and have also required administrative prep work to get into place. For example, the budget problem and resulting difficulties in hiring have meant that we had no staff resources whatsoever to handle lost and found or 311 complaints for all of 2010. Very soon we will have one person dedicated to each of those functions. I think we have made great strides in the quality of new driver training, but as you are aware we recently lost that staff person and have to wait our turn in the (also very understaffed) Human Resources section that processes all new SFMTA hires to get a new person on board. Reviewing gate fees and meter rates and a PCN study has had to wait for the approval of a work order with the Controller's Office, which, after 6 months of bureaucracy was just approved by the Board last last week (approved November 2 for a fiscal year that began July 1). Hiring an adequate number of Taxi Investigators has required getting a half a million dollars of funds away from the SFPD work order that used to fund a Taxi Detail and back into Taxi Services’ budget, a process which has been going on during all of the this calendar year and which even now is not yet “in the bag,” shall we say. In order to write a citation you need a citation book. In order to print a citation book we had to review and amend the penalty amounts and code section numbers to print them on the citation. If you give someone a citation you have to give them a way to pay it, and it didn’t seem to us that making violators come to our window between 9-11:30am and 2-5pm and write us a check was a reliable collection method for $5,000 fines. So we had to acquire the ability to process credit cards, and we are have been for some time patiently following the City’s process to be included on the parking citation website so that violators will be able to pay over the internet. The legislation that we are about to introduce to the Board of Supervisors, that will give Taxi Investigators the authority to issue parking citations and tow vehicles and which creates several taxi-industry specific crimes, has taken months to develop, in part because we are competing for the limited resources of the City Attorney's Office, which must sign off on all ordinances. My mantra in this job has been "one foot in front of the other." We have made progress and it has been slow so far, but you will see the momentum increase as all of this careful groundwork begins to bear fruit. I don't think Uber is doing anything illegal. I DO think if you go after them, you'll have a lot of unhappy people who embrace a refreshing system to the stale, protectionistic taxi system. Seriously. Do you understand that the system is broken?? Or is that lost on you? I'm not trying to be a jerk for the sake of being a jerk, but it's a mess and entirely inefficient as well as ridiculously low on capacity. San Francisco has millions of people. If anything, Cabulous and Uber (I use both) are simply assisting you in keeping people moving. They are helping you where you have failed. John, I totally agree with Centralized dispatch systems. I'm hoping more innovators are working on getting in the game soon to solve all of our transportation issues. San Francisco is particularly awful. I'm excited to see the competition that springs up. It's annoying how the entrepreneurs will be the ones making our lives better while the government clings to dysfunction. Idea: Stop fining people $5000. Use that money to FIX YOURSELF. I wonder if you would still feel Uber is so fabulous if you or a family member were injured in one of these under-insured limos. There are no criminal back ground checks done on these limo drivers. If you have a problem with the driver, you have no 311 system to file a complaint. Just because a shiny town car shows up doesn't mean it is safe. It isn't safety inspected as SF taxis are. It may have 400,000 miles on it. You are excited about a bunch of entrepreneurs who are just running a skimming operation with no regard for public safety. This was my initial concern with uber before I used them. However, they only use licensed drivers pro drivers and do filter them on licenses and insurance. That's bogus misinformation that they don't. Sounds to me like you work for Uber. That is fine if you do. I welcome any discussion with this company. I never said Uber drivers don't have licenses or insurance. A person with a serious criminal background can carry a drivers license in California and drive a limo. They cannot hold an A-Card and drive a San Francisco taxi cab. I didn't say the limo companies didn't have insurance. San Francisco taxi cabs carry a mandatory $1,000,000 policy. When a customer climbs in one of these cabs, they know they are covered. Can Uber say the same thing about their limos? There is no bogus misinformation here. The standards for public safety are extremely high and vigorously enforced by the SFMTA. This is not the case with the limo industry. This Question is directed to Chris Hyashi. I am very happy to see that you state that the SFMTA will go after taxi companies that are unscrupulous. I have noted the comment about National Cab Company who was apparently sued over no workers compensation years ago. What current checks does the SFMTA use to ensure that cab companies have workers compensation in place? National Cab still tells their drivers they do not have workers compensation and does not post it on the lot as required by state law. What can the SFMTA do about this company and other companies that neglect the rules set forth by the SFMTA and state regulations? I hear that the SFMTA is only in place to work on permits and violations of permits. Not having workers compensation in my eyes would be a huge violation. Workers compensation is only one safety net in place to protect a driver who is hit by an uninsured motorist. If the SFMTA is serious about assisting the drivers, we need to be insured behind the wheel, and uninsured motorist coverage should be extended to all drivers. Currently many companies state we do not have insurance for the drivers behind the wheel. Dear Anonymous, I am not Chris Hayashi. But you're question about workers' comp... workers can check with the California Department of Industrial Relations. A worker can file a formal complaint if their employer is violating workers' comp laws. I think that there is solutions to the problems every time the government should take the responsible actions to support the industry. The authorities must establish the system like airport car services to shift the cabs like on other airports like Airport Taxi Minneapolis and Newark Airport Car Service. I will say it is the responsibility of Govt. to handle and facilitate the people... i also use the San Antonio Limousine and hope they will also do like that..
Yup, this is the resposibility of the authorities to take reasonable steps for the problem. Limousine Service Chicago offers a full range of services from special events, corporate travel and airport transportation our mission is to provide the highest level of customer service, treat yourself to an extraordinary experience you won’t forget. calling dispatch number that would dispatch the closest available cab,no matter which company it is best opinion..I think government should pay some attention to find such solution.. There are countless companies that claim to provide a superlative to the airport. The first thing to do is find out which companies are specialized in the Taxi from the airport. The most important feature of airport taxi is its advanced booking facility. This is responsibility of the authorities to take reasonable steps for the problem. Very nice discussion. And the article too. Quality post!!! it is a nicely written post with so many good facts ! thank you for sharing it with us ! Your post is really very good, it describe the reality of poor Taxi drivers of SF. Thanks for sharing this nice post. Getting the transportation services from airport will save your time. Plan your trip from Denver to Vail transportation for the business trip or family vacation.